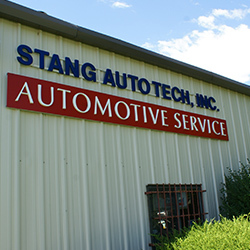 Since 1980 Stang Auto Tech has been providing motorist with expert car and truck repair services with a commitment to principles that are based on family, community, and faith. We are a full-service preventive maintenance and auto repair center that has been performing high quality, guaranteed, automotive repairs that include Car Care, General, Undercar, Heating and Cooling, Electrical, Transmission, Electronic, Internal Engine, Heavy-Duty, Fleet, Towing, Tuning Services, Hybrid Car & Electric Car Services in Broomfield, Adams and Boulder counties. We are a family run company that works to provide a flexible and supportive atmosphere for our staff and customers. We utilizing "State of the Art High Tech" tools and technology, along with regular, on-going training we have established Stang Auto Tech as leaders who are able to adapt to the massive changes within the automotive industry. We strive to always be cheerful (the last thing you need is a grumpy mechanic), provide helpful analytics so that you can make well-informed choices about your repairs. We have put hundreds of area cars back on the road quickly and happily. The mission at Stang Auto Tech is to maintain an inspiring and motivating environment for our customers and our employees, breeding a culture of excellence. We will act from the genuine desire to identify and exceed our customers’ needs and expectations, with their best interest in mind. We will hold ourselves to the highest level of integrity and honesty, refining our practices to insure the best value for our customers and employees. Accomplish consumer confidence by being a respected, trusted and successful automotive service facility, cultivating integrity, ethics, and company attitudes which create a mutual benefit to our customers and our organization! Provide every available resource empowering our employees to excel in their abilities; meeting the needs of the customers and the challenges of the automotive industry! To cultivate a long term team environment that is supportive of the Customer, Employees, Venders, and Company! Act with honesty and ethics in everything we do. A character that is bidirectional and constant not turned off and on for convenience. Do the right things, for the right reasons, at the right times. Our careers are to sustain the life we are intended to live. We must be committed, persistent, diligent, and disciplined to pursue with balance. Strive for perfection even if we will never be. Sharpen the Saw with training and personal growth. If we are not moving forward, we are moving backwards. Our lives and the world around us is constantly changing, and so must we. Believe in the good nature of mankind. Continually focus on building confidence, trusting relationships, and serving others at Home and Work, with Family, Friends, and Peers. Give back because of what we have been given. Be who you are intended to be, don't let others make you into anything else. Value our individuality and our ability to excel in what we do. Be thankful for what we have, not focusing on what we don't or want. Look for the lessons to be learned each day from the challenges we are faced with. Peace of mind doesn't stop in Colorado. We have one of the best WARRANTIES available in the industry. Our GUARANTEE covers you for 36 month or 36,000 miles, nationwide. The Rescue Me Roadside Assistance includes: Towing, flat tires, no starts, keys locked-in, and a variety of other services that could leave you otherwise stranded. Call 866-588-0728 to be directed to the nearest facility to handle your related service or repair.